The Olympic event that was “held” on this day was actually the 1904 Olympic football tournament, which was contested from 16-23 November, although no actual match took place on this day. Our database works like that! Matches were held on 16, 17, and 18 November, and then on 23 November. Luigi Beccali, Italian middle-distance running great, who ran the 1,500 metres at 3 Olympics (1928-36), and won the gold medal in 1932 and bronze medal in 1936, was born on this day in 1907. Peter Gabbett, Britain’s greatest decathlete prior to Daley Thompson, who competed at the 1972 Olympics, but did not finish, was born on this day in 1941. Dianne de Leeuw, an American who was among the first Olympians to participate in the athletic diaspora by choosing to compete for another nation, was born on this day in 1955. De Leeuw had dual citizenship and chose to compete for the Netherlands in figure skating at the 1976 Winter Olympics, winning a silver medal behind Dorothy Hamill. Gail Devers, the greatest American female high hurdler, was born on this day in 1966. Devers competed in five Olympics, but never managed a gold medal in the 100 hurdles, which was considered her best event. She did, however, win back-to-back gold medals in the 100 metres in 1992-96. Kerri Strug, famous in the US for taking her final vault in the 1996 team gymnastics competition, was born on this day in 1977. Strug took that vault on a severely injured ankle, feeling she needed to post a high score to help the US women win the gold medal. It later turned out that she did not have to take the vault for the US to win gold. Mahé Drysdale, New Zealand single sculls rowing champion, was born on this day in 1978. Drysdale was gold medalist in the single sculls in 2012 after winning a bronze at Beijing in 2008. Drysdale was a five-time World Champion in single sculls, winning in 2005-07, 2009, and 2011. Dayron Robles, Cuban high hurdler who won the 110 hurdle gold medal at the Beijing Olympics, was born on this day in 1986. Simpson Foulis, a Scottish emigré who competed in golf at the 1904 Olympics, died on this day in 1951. Foulis’s brother, Jim Foulis, won the second US Open championship in 1896 at Shinnecock Hills. Taisiya Chenchik, Soviet high jumper who won a bronze medal in the event at Tokyo in 1964, died on this day in 2013. 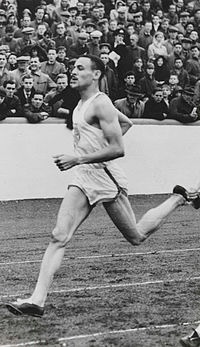 And sadly, we must mention the death late last night (on the 18th) of American Mal Whitfield, who won three gold medals at the 1948 and 1952 Olympics, including golds in the 800 both years, and added a bronze medal in the 400 in 1948. Whitfield later had a long career in the US foreign service. His daughter, Fredricka Whitfield, has been a long-time news anchor for CNN.